We use Arizona Archery Z nocks and Plastinocks. 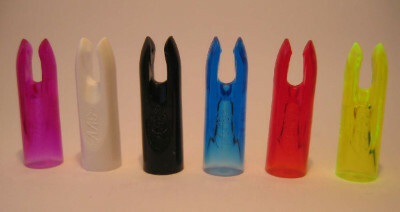 Plastinocks are a slim nock popular with target and clout shooting, less robust compared with Z nocks. Z nocks are more visible and stronger. We have 1/4", 9/32" and 11/32" Nocks in stock. 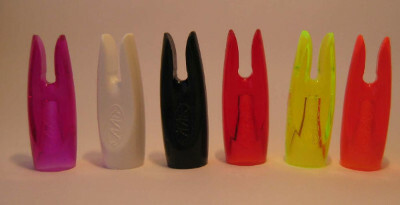 Colours Purple/ White / Black/ Blue/ Red / Fluoro Green / Fluoro Orange. We stock Brass points mainly and also have some stock of steel / Aluminium and Nickel points.